Rachel Cedar is a New York City mother and social worker who specializes in helping parents with toddlers. She confesses that, until recently, she never really played with her little boys, ages 6 and 4. To Cedar, it seemed she was always watching the clock, “waiting for the Holy Grail moment of parenting to arrive”— when her children wanted to play independently. Then, one rainy afternoon, she was putting away laundry as the kids nipped at her heels. 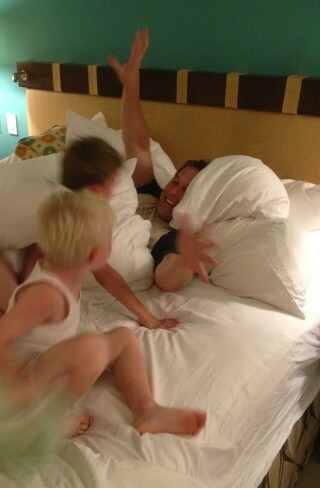 Omer Cedar has a friendly pillow fight with sons Eli and Sam. In that moment, Cedars says she realized how much fun she was having and how connected she felt. As a bonus, after the pillow fight, she says her boys became the most “compliant” children she’d ever seen. With that inspiration, she devised the “28 days of play” blog series, which launches today, and invites writers to reflect why playing with your kids can seem so hard. What about modern parenting keeps us from enjoying playtime? Writer Allison Slater Tate, an Orlando, Fla., mother of four, doesn’t believe that she needs to “get on the floor and play“ to be a good parent. But she does think that “having fun” with your kids is vital. For many parents, it’s often hard to tap into our sillier side. We feel self-conscious pretending to be trapped in a cave or dancing to the “Frozen” soundtrack. Rachel Cedar used to dread requests of “Mom, play with me!” but she’s learning to love it. And playing with your kid isn’t “just playing,” says Lawrence Cohen, psychologist and author of “Playful Parenting.” It builds a specific kind of closeness, which, according to him, fosters a real cooperative bond between parent and child — much like Cedar saw after her pillow fight. “We constantly drag children into the adult world, with errands, and chores and ‘right now,’” Cohen explains. To counteract that, we need to enter the child’s world, and with young kids that’s often the world of imaginative or dramatic play. By the same token, kids need “rough and tumble play” with their parents, too, says, Dr. Anthony Debenedet, an Ann Arbor, Mich., dad to three girls and co-author of “The Art of Roughhousing.” The perception is that physical play is dangerous or makes children hyperactive. But Debenedet explains that rolling around on the floor with your kid has the opposite effect. Roughhousing with a parent, he explains, releases oxytocin or the “cuddle chemical,” what some scientists call the biological basis of empathy.